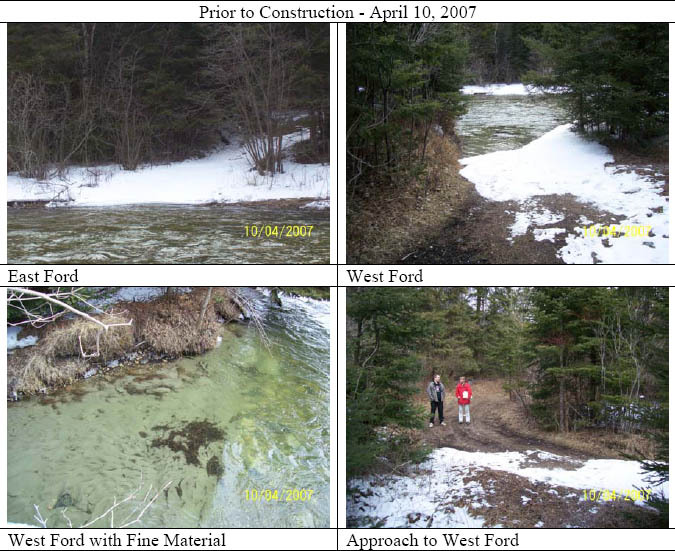 The rehabilitation of Manitou River Site M-03 involved the enhancement of fish habitat adjacent to an existing ford and the stabilization of the ford to prevent further sedimentation from occurring. This access is utilized by many recreational landowners who cross the Manitou River to reach their properties on the other side. Movement across this ford caused silt and clay to continually erode downstream and cover locally important spawning habitat (i.e. gravel). This site was in drastic need of fish habitat protection, improvement and rehabilitation. 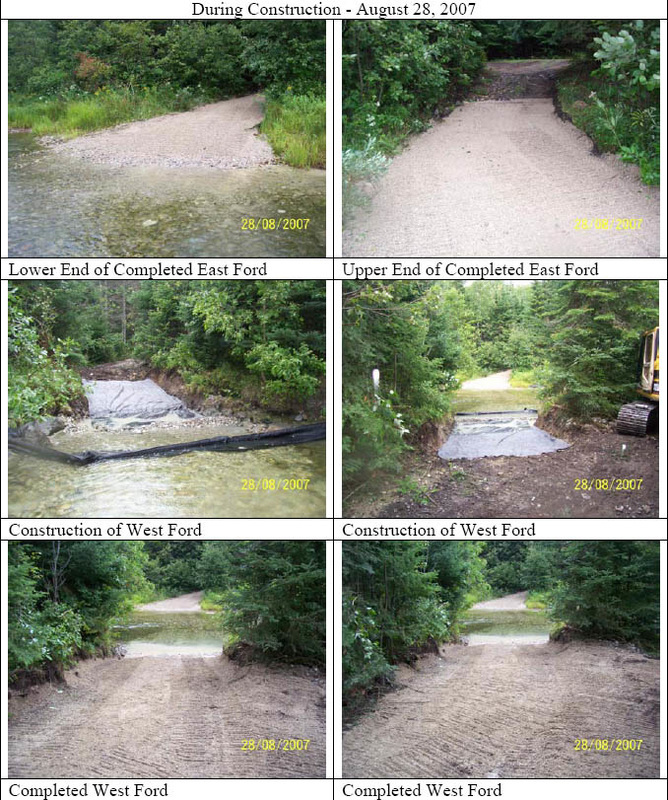 The placement of clean and smooth ½” average diameter, glacial origin spawning gravel to a depth of 0.3 m was placed over an area of 200 m2 immediately downstream of the ford. As well, large 20-30 cm boulders were placed to prevent the downstream migration of the placed spawning gravel and it also provides current breaks and habitat for juvenile fish and aquatic invertebrates to use. The work was completed according to the site plans through the cooperation of landowners, dedication of “Manitoulin Streams” volunteers, consulting expertise of Great Lakes Environmental Services (GLES) and equipment, material, and services of Lloyd & Sons Trucking Ltd. Funds from various sources were used to complete this project. Heavy equipment rental and purchase of materials to complete the project were paid for by the following funds; CFWIP, Eco-Action and COA contributed for site supervision by a certified engineer. This project had up to 19 volunteers from Manitoulin Streams working on this project at various times. Manitoulin Streams had numerous meetings and email communications to discuss the details about this project including sending out Site Design Request for Proposals, Tenders and Site Supervision to ensure proper delivery of site design and issuing a winner of the bids. A total of 50 hours of volunteered hours was dedicated by “Manitoulin Streams” committee members attending meetings to discuss planning procedures. Overseas communication (by phone and email) with the landowners had to take place in order to rehabilitate this site. Also, meetings with employees of the Royal Michael’s Bay Resort on behalf of the landowners to gain access to the property for site rehabilitation occurred. CFWIP money was used to purchase non-woven geo-textile and installation of a 300mm layer of compacting Granular “A” gravel material and field stone. This fall, salmon were seen spawning in this newly placed spawning gravel. Erosion of the stream bank had caused sediment to be displaced down stream over critical fish habitat. The pictures demonstrate the erosion occurring at the point of entry and exit of the Manitou River which needs bank stabilization. Meetings with Royal Michael’s Bay Resort took place to discuss rehabilitation efforts.